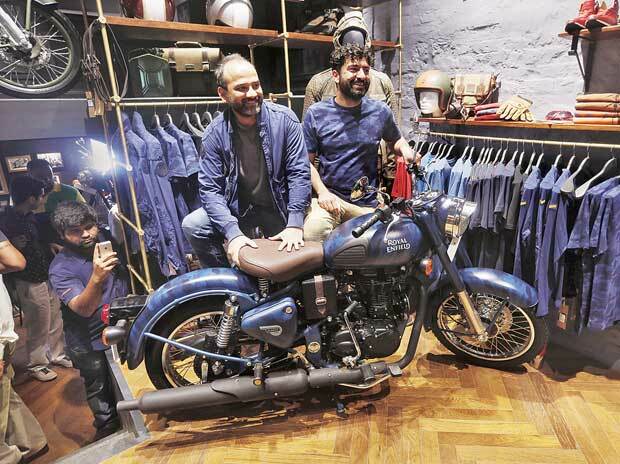 Eicher Motors Chief Executive Officer Siddhartha Lal (right) and President of Royal Enfield Rudratej Singh at Royal Enfield's new flagship store in New Delhi The Eicher Motors stock shed 1.6 per cent after the September quarter (Q2) results marginally missed consensus estimates. Led by a strong 21.7 per cent growth in volumes of Royal Enfield, the company posted a 23.5 per cent increase in consolidated revenues to Rs 2,167 crore, its highest quarterly sales to date. This is, however, lower than estimates at Rs 2,208 crore. The miss in estimates is due to the lower-than-estimated realisations at Royal Enfield. The company passed on the two per cent price drop after the implementation of the goods and services tax (GST). Despite the increase in raw material costs, which went up 24 per cent year-on-year, the company improved its operating profit as well as margins. Operating profit, at Rs 683 crore, was 26 per cent higher than the year-ago quarter, while margins at 31.5 per cent were 60 basis points higher than Q2 of FY17. The management attributed the improvement in operating performance to better cost management as well as gains from operating leverage, including lower sourcing costs. Though commodity costs have firmed up, the company has not taken any price hikes as yet. While the order backlog continues for about 1-1.5 months on select models, about 94 per cent of the volumes continue to come from models with engine size of up to 350cc. Analysts at Jefferies believe growth rates will come down to 15 per cent from FY19 as waiting periods come down and production scales up. Going ahead, in addition to its core models, the company will also bank upon two new products it showcased last week — the Interceptor 650 and the Continental GT 650 café racer — to push incremental volumes and revenues. The commercial production of new twin-cylinder bikes (all earlier bikes were single-engine units) will start in the first half of next year. Though they will also be available in India, the focus will be on export markets, both developing and developed, where the company has presence. The company hopes that the new bikes will replicate the success of the 350cc bikes in India in the developing markets. 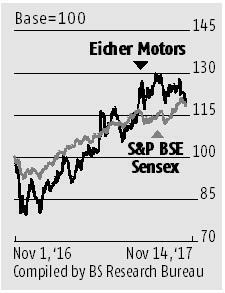 On the Volvo Eicher (VECV) joint venture, while the company improved volumes by 12 per cent, it lost market share given the much faster industry growth in the medium and heavy commercial vehicles (M&HCV) space. Its market share in the CV space has come down from 13.6 per cent in the year-ago quarter to 13 per cent now. The management highlighted the tough market conditions leading to higher discounting, though the company is focusing on improve profitability rather than pushing for higher market share. Margins for the VECV joint venture were 200 basis points higher than the year-ago quarter at 9.2 per cent.